The bane of many gardeners, slugs and snails enjoy munching on vegetation. If you've walked outside in the morning and seen the shiny trails leading to your garden, you know one of these guys was sampling your greenery. Snails and slugs have more in common than differences. Slugs and snails are mollusks, the same family of creatures claiming oysters, octopus, squid and clams. There are more than 60,000 species of snails and slugs. The varieties living in the sea begin life as larvae floating about in plankton. Land and freshwater slugs and snails typically hatch from eggs. The main difference between slugs and snails is the equipment the snail comes with; his shell, which grows along with his body. Most snails are gray, but the shells can range from white to brown or almost black, and be mottled or striped. The snail's head has two pairs of tentacles; a large pair holding his eyes and a smaller pair beneath for smelling. His mouth is below the lower tentacles, and the slime gland is beneath the mouth. 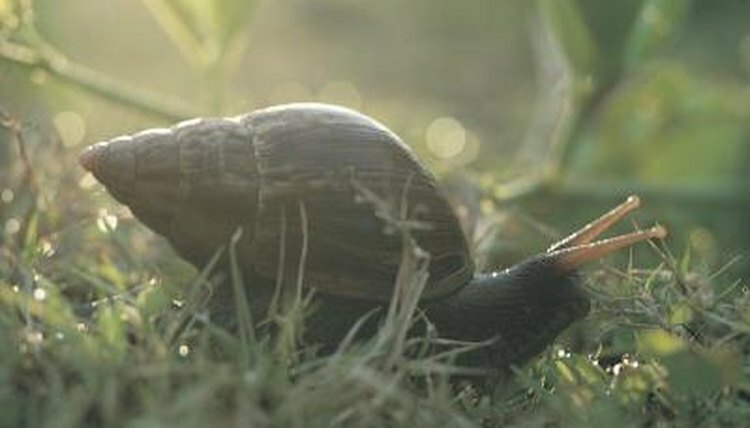 The snail's shell holds his visceral hump, where the organs are located. The shell joins the snail's body, providing him refuge when he's disturbed. Like his cousin the snail, the slug has two sets of tentacles and a mantle. In addition to lacking a shell, he also has no visceral hump. Slugs range in size from a quarter of an inch long to 10 inches, depending on their age and variety. They vary in color from a light yellow to shades of gray and black and are often mottled with darker shades. Like the snail, a slug propels itself forward by sending waves of small contractions from the back of its base toward the front. Slugs are especially sensitive to finding a damp spot to call home, as they don't have the protection the snail's shell provides. Both guys are mostly nocturnal, but will step out on dark days or evening hours. Dryness is bad for them, so they'll try to stick to damp environments. The mucous snails and slugs produce helps them be the only mollusks able to live on land. The mucous allows them to retain moisture in their bodies as they travel across dry land and protects them if they scrape across a sharp object. Predators don't care for the mucous either as it clogs their mouth when they try to enjoy a slug for lunch. What Is the Slime That Comes From Snails & Slugs? Do Snails Like Dark Places? What Does It Mean When Snails Start Bubbling? Do Snails Have a Mouth?